Everybody knows that happy kids means happy holidays, so make sure that they stay smiling by keeping them warm and protected on the snow. We have everything you need to kit nippers out from head-to-toe, including cosy clothing, cool accessories, and a wide selection of goggles and sunglasses. Many resorts won’t allow children on the mountain or in ski school without a helmet. Ski resorts allow you to rent helmets, although you can’t guarantee their fit or quality. Little ones will notice a restrictive or loose helmet even faster than a grown-up, and might be reluctant or hesitant to wear it as a result. It’s important to buy a kids’ ski helmet that fits them now (not one with ‘room to grow’), and to ensure that they can fasten it up correctly. It’s also worth buying a soft and toasty hat (like Barts Kids Poukie Beanie, pictured) to keep heads and ears warm in-between runs. Ultraviolent rays are more intense in the mountains and skin damage occurs more quickly, due to the sunlight reflecting up from the snow. However young your child is, invest in high factor suncream for them to reapply throughout the day, and ski goggles or sunglasses to protect their eyes from wind and snow. Nothing spoils the fun faster than numb, frosty fingers, which is why warm, waterproof gloves or mitts are an absolute must. Mitts (like the Barts Nylon 3D Mitts) are easier for smaller children to put on and are often warmer than gloves. Ensure that the gloves cover the wrists too, otherwise your child will feel cold faster if they’re exposed. It’s always wise to pack spare thermals and gloves, just in case their first pair ends up wet or even lost. Keep a couple of hand warmers (teabag-size sachets that provide heat when shaken for up to six hours) in your kids’ gloves or jacket pockets. 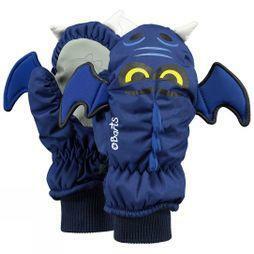 These are ideal for warming up little hands throughout ski school. The correct combo of stylish performance clothing will keep your child toasty, comfortable and happy. Layer-up your kids with a warm, sweat-wicking base layer, soft fleece and insulated waterproof jacket and pants. Look for clothing with plenty of zipped pockets, to safely stow away those small essentials. Many children's garments will have more insulation than adult versions, as kids lose heat more quickly. If you invest in a winter one-piece, we recommend purchasing a warm jacket for the evenings as well. Pack their pockets with snacks to keep energy levels up and ensure they drink plenty of water. Dehydration leads to fatigue and impairs muscle performance, making you ache more at the end of the day. When shopping for kids’ ski boots, you’ll notice that the younger the age range, the simpler the design; the Atomic Waymaker for example, only has a single buckle so that it be easily slipped on and off while still offering sufficient support (pictured). For children's ski boots, comfort and support are the main priority. We recommend bringing your kids in-store where our trained technicians can expertly fit their boots, especially from the age of 9-10 when more precision is needed to learn and develop new ski and board skills. For more boot-sizing advice, read our ski boot buying guide and snowboard boot buying guide. For après ski, combine snow boots with cushioned, sweat-wicking ski socks to keep toes warm and dry while playing in the powder. Our Kid's Buy Back Scheme means that when you purchase children’s boots and ski/snow equipment from us and your children grow out of them, you can return them for up to 20% off your next kids buy! Just like you, your child will enjoy riding more if they have the correct skis or snowboard or their size, weight and ability level. Kids’ skis should reach somewhere between the chin and their forehead. Kids that are heavier and/or more skilled suit longer skis, while piste-based skis are generally shorter than freeride skis. Depending on the manufacturer, skis of certain lengths may offer different levels of flex. For snowboards, choose something that stands between chest and chin. For beginners and lighter kids choose a shorter board; if your child is heavier or owning the park at speed, choose something longer. Your children will develop technique and grow confidence faster if they are equipped with the correct-sized equipment (not boots and skis/boards with ‘room to grow’). Practising basics and fundamentals will help prevent your kids from picking up bad skiing and snowboarding habits that are hard to break! In order to make your life as easy as possible when preparing for your latest (or even first) family ski holiday, we have asked our buyers to assemble a handy checklist to ensure your kids get the most out of their time on the snow. Nothing spoils everyone’s fun quicker than becoming wet and cold, so have a look through this list to ensure that you get everything you’ll need to keep your kids warm and happy. Height and weight are both important in choosing the correct size skis for kids, but as a general rule, kid’s skis should hit somewhere between their chin and forehead, but like adult skis, the most suitable length depends on a few other factors. Our stores have a wide range of kid’s ski equipment so if in doubt, visit us in store and get expert advice from our knowledgeable staff.